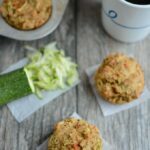 These Zucchini Carrot Apple Muffins are packed with fruits and veggies and make a healthy, kid-friendly breakfast or snack! Add remaining ingredients and stir until just mixed. Batter will be very thick. Stir well to ensure all flour is mixed in. Bake at 375 degrees F for 20 minutes or until toothpick inserted into center comes out clean. Measure the zucchini, apple and carrots AFTER you squeeze the water out of them. I used 1 medium large zucchini, one large apple and 8-10 baby carrots.